The question the construction worker was asking me didn't initially raise any red flags. I had just put the two tots down for naps and I was changing into a sun top, because I planned to sit on the deck, soak up some rays, and read my book during nap time. I heard the younger dude of the dynamic duo call up the stairs, 'Um, do you know where the main shutoff valve is for the water?' The sun . . . it was beckoning me, but I left my room and jogged down the stairs to show him where the valve was in the basement. The young guy followed me down to the basement. I had just learned where our main water valve was located. How handy! I felt like a grown up, a homeowner . . . wise beyond my years. 'It's in the back of the storage room,' I was explaining . . . that's when I heard it. It sounded like a waterfall in my basement. I glanced around but didn't see the source. As I rounded the corner there was the older guy electrician standing on a small step ladder. His hands were inside a gaping hole in the ceiling. He was attempting to keep the water from pouring thru the ceiling. An impossible task considering that they had accidentally broken a pipe. Not a pipe that operates with a trickle. Nope. A serious pipe that apparently moves or holds lots of water. I rushed into the storage room - pointed to the valve in the corner and then turned my attention to the newest feature of our recently finished basement: a splash pad. annoying but they saved the day. While the kitchen has been under construction (for 8 weeks, but who's counting? ), we have been operating out of the tiny but functional basement kitchen. It's functional, if you count the absence of a dishwasher a way to function. (8 WEEKS, friends, 8 WEEKS - and no end in sight!) I suppose our dish washing chores are minimal considering we are relying heavily on paper/plastic products, but any cooking and bam, the whole damn sink overflows with pots, pans, and Pyrex. In order to dry all of the clean dishes, I spread towels on the table. We have an obnoxious supply of white towels. 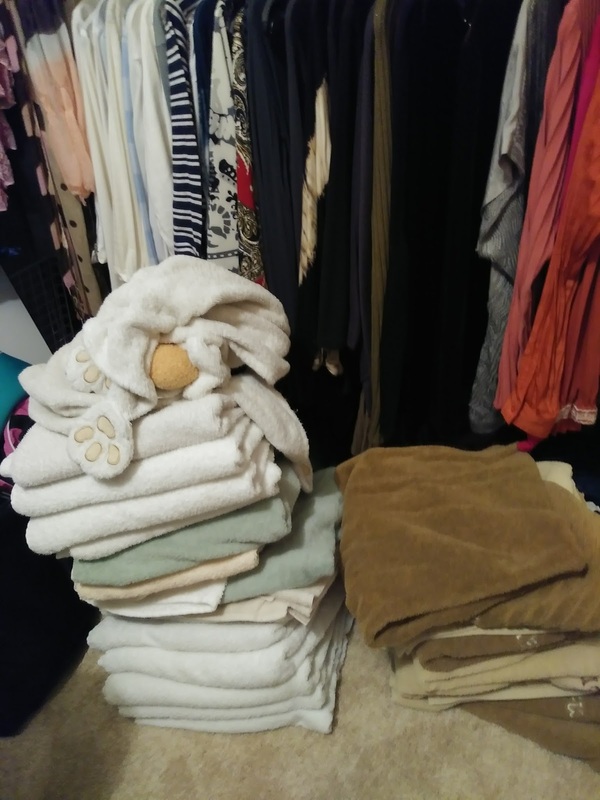 I have never purchased a white towel, mind you, but Laddie's swim team involvement has led to a ridiculous inventory of mismatched whitish towels. I should probably bring a stack back over to the high school one day . . . when the basement is done and we no longer need towels for dish drying. (Ha, I just said 'basement done' as if that is a thing). Displaced bins housing floating legos and guys. So when our basement sprung a leak that afternoon, I scooped up the handy/stolen towels and tossed them to Mr. Waterworks. The bookshelf directly below the flowing water took a direct hit. Bins housing legos and plastic princesses collected water making it look like a scene from 'the Lego Movie' when the main characters escaped near disaster by stowing away in a double decker lego couch. Cool. 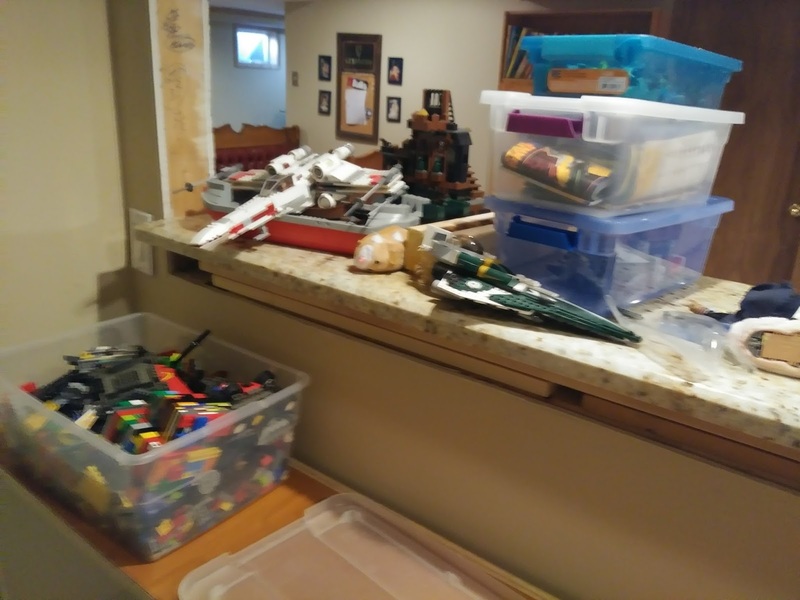 Legos are swimming in my basement. It killed me. Summer had just ended and I had just washed a bunch of beach towels, but I raced upstairs and grabbed these clean towels. I handed the pile to the electricians and backed away slowly. It was a bummer, but I would NOT get roped into cleaning that up. I knew I would end up washing the towels, AGAIN. The sun was waiting. The boys' nap time might include a short snooze for me on my lounge chair. I would need to rest up anyway - because soon it would be time to wash dishes again. Ughhhh!!!! The joys of renovations! Hopefully this isn't going to push your timeline out even more!